66 SMOKESHOP August 2016 Flor de Selva Unveils Branding Evolution Maya Selva Cigars has launched the latest branding evolution of its flagship brand, Flor de Selva, including an updated logo, cigar ring plus footer, and streamlined box. The company states the changes come as a culmination of the brand's global growth in an effort to modernize the marketing elements and bring a higher level of sophistication to its familiar look. After 21 years of operation with expanding markets across the Americas and Asia, as well as continued success in Europe, the company felt compelled to tie the brand more closely to its origins—the culture and people of Honduras. The brand still uses the Harvestress as the iconic figurehead for its logo, however in a more prominent and elevated position. The elegant, traditional cedar boxes are now stamped with the new logo. Flor de Selva cigars will now each have a personalized ring per vitola, and its footer showcases an updated signature and a tactile rendition of the "petate," which is a Mayan symbol representing the foundation or base of a structure. The company will also debut the Grand Pressé, a new 6 x 56 "prensado" vitola in its Flor de Selva Maduro collection, featuring a naturally-fermented Honduran Habano wrapper, Brazilian Mata Fina binder, and Honduran fillers. Presented in 10-count cedar boxes, the new shape will be offered at $11.75 suggested retail. The updated Flor de Selva collection can be viewed in its entirety at this year's IPCPR trade show in Las Vegas. Maya Selva Cigars, Hollywood, Fla., Tel: (954) 842-3613, Email: janet@mayaselva-cigares.com, Web: mayaselva-cigares.com. 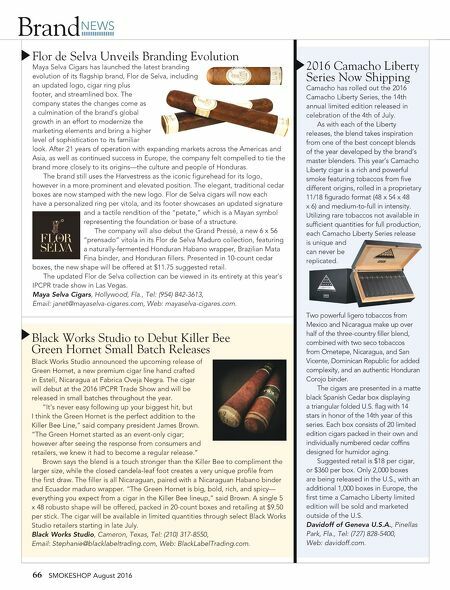 Brand NEWS Black Works Studio to Debut Killer Bee Green Hornet Small Batch Releases Black Works Studio announced the upcoming release of Green Hornet, a new premium cigar line hand crafted in Estelí, Nicaragua at Fabrica Oveja Negra. The cigar will debut at the 2016 IPCPR Trade Show and will be released in small batches throughout the year. "It's never easy following up your biggest hit, but I think the Green Hornet is the perfect addition to the Killer Bee Line," said company president James Brown. 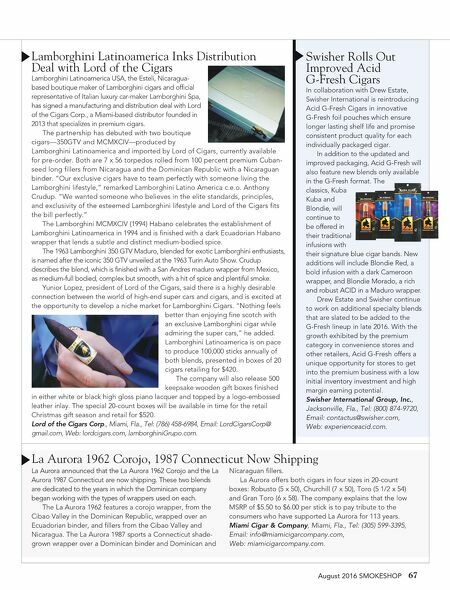 "The Green Hornet started as an event-only cigar; however after seeing the response from consumers and retailers, we knew it had to become a regular release." Brown says the blend is a touch stronger than the Killer Bee to compliment the larger size, while the closed candela-leaf foot creates a very unique profile from the first draw. The filler is all Nicaraguan, paired with a Nicaraguan Habano binder and Ecuador maduro wrapper. "The Green Hornet is big, bold, rich, and spicy— everything you expect from a cigar in the Killer Bee lineup," said Brown. A single 5 x 48 robusto shape will be offered, packed in 20-count boxes and retailing at $9.50 per stick. The cigar will be available in limited quantities through select Black Works Studio retailers starting in late July. Black Works Studio, Cameron, Texas, Tel: (210) 317-8550, Email: Stephanie@blacklabeltrading.com, Web: BlackLabelTrading.com. 2016 Camacho Liberty Series Now Shipping Camacho has rolled out the 2016 Camacho Liberty Series, the 14th annual limited edition released in celebration of the 4th of July. As with each of the Liberty releases, the blend takes inspiration from one of the best concept blends of the year developed by the brand's master blenders. This year's Camacho Liberty cigar is a rich and powerful smoke featuring tobaccos from five different origins, rolled in a proprietary 11/18 figurado format (48 x 54 x 48 x 6) and medium-to-full in intensity. Utilizing rare tobaccos not available in sufficient quantities for full production, each Camacho Liberty Series release is unique and can never be replicated. Two powerful ligero tobaccos from Mexico and Nicaragua make up over half of the three-country filler blend, combined with two seco tobaccos from Ometepe, Nicaragua, and San Vicente, Dominican Republic for added complexity, and an authentic Honduran Corojo binder. The cigars are presented in a matte black Spanish Cedar box displaying a triangular folded U.S. flag with 14 stars in honor of the 14th year of this series. Each box consists of 20 limited edition cigars packed in their own and individually numbered cedar coffins designed for humidor aging. Suggested retail is $18 per cigar, or $360 per box. Only 2,000 boxes are being released in the U.S., with an additional 1,000 boxes in Europe, the first time a Camacho Liberty limited edition will be sold and marketed outside of the U.S. Davidoff of Geneva U.S.A., Pinellas Park, Fla., Tel: (727) 828-5400, Web: davidoff.com.